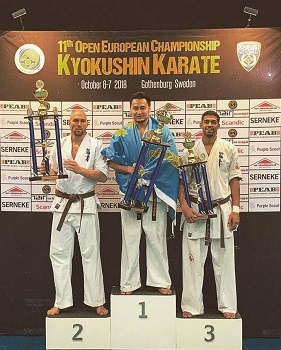 6-7th October the Swedish Kyokushin Union organized their European Championship. Several organizations participated, and once again Gothenburg, Liseberg, was the place for a Kyokushin event. Only three week back, The Swedish Ope war held, and some of the fighters showed great spirit and fought in both tournaments! The tournament had 179 participants registered in total, and as we mention some of them fought at the same arena only three weeks ago, Simon Pålsson, Fady Allan, Mette-Marie Nielsen, Sanne Larsson, Moa Jensen..
Visit official website for full results, Kata, Juniors and Old Master..